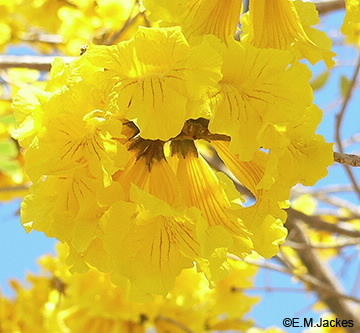 This Nicaraguan tree has large, bright yellow flowers in clusters, it tends to flower in several bursts. Although not growing on campus it may be confused with 1)T. aurea, however the bark is not corky, flowers are larger and a brighter yellow and the capsule is long and narrow, usually more than 30 cm long and about 1.5 cm wide, usually bearing some short rusty-coloured, stellate and simple hairs, as well the leaves are not whitish on the lower surface. 2) It may be distinguished from T. (H.) chrysotricha by the distinctive red lines in the throat of the corolla, these are more obvious when dry, and the fruit which has short stellate or branched hairs on the surface.